The theory is based on the application of hemodynamics principles governing the flow direction. According to Poiseuille’s law, in order to create a flow, or a reflux, from a point A to a point B, a pressure gradient is needed. In this interpretation, point A is the refluxing source (so-called escape point): for example, an incompetent sapheno-femoral or saphenopopliteal junction, an incompetent tributary or perforator. Point B is the socalled re-entry point: usually a perforating vein through which the refluxing flow goes back into the deeper veins, after having pathologically escaped from the same deeper network through an escape point (point A). Fig. 1: Escape and re-entry point concept: An escape point (EP) is defined as the anatomical site in which venous flow pathologically moves from the deepest toward the most superficial compartments. It can be an incompetent sapheno-femoral or sapheno-popliteal junction (A), an incompetent tributary along the leg (B) or an incompetent perforator (C). A re-entry point (RP) is the perforating vein draining the refluxing blood back into the deeper venous compartment. It can be localized along the saphenous and/or along an incompetent tributary. The escape points are the site of CHIVA selective ligations. According to Bernoulli’s principle, in two communicating vessels, the one presenting a higher flow velocity will display a lower lateral pressure: a gradient will be created and the blood will flow from the slower to the faster vessel. The aspiration effect performed by the higher velocity vessel is universally known as the Venturi effect (fig. 2). Fig. 2: The Venturi effect inside the venous system: As a consequence of Bernoulli’s principle, increasing the velocity (v) leads to a lateral pressure drop (lp). Inside two communicating vessels, the principle leads to an aspiration from the compartment moving at a slower velocity (v2) toward the one at faster flow (v1). The phenomenon is associated with a higher lateral pressure (lp2) inside the vessel presenting a slower flow (v2). After CHIVA selective ligations, pressure gradient changes are associated with velocity changes and thus with an aspiration effect from one compartment to the other.4 Looking at the CHIVA theory, it becomes evident that it is not perfectly overlapping the so-called “descending theory,” which is different from what is usually thought. Following valve incompetence, venous reflux develops from the most proximal parts of the venous network toward the most distal regions of the leg. For example, an incompetent sapheno-femoral junction feeds a reflux progressively involving the most distal part of the superficial venous system.5 The descending theory is in opposition to the ascending one. CHIVA theory is neither ascending nor descending: it’s based on the pressure gradient concept expressed by Poiseuille’s law and on the possible restoration of energy gradients. A subsequent restoration of the physiological order of drainage follows. 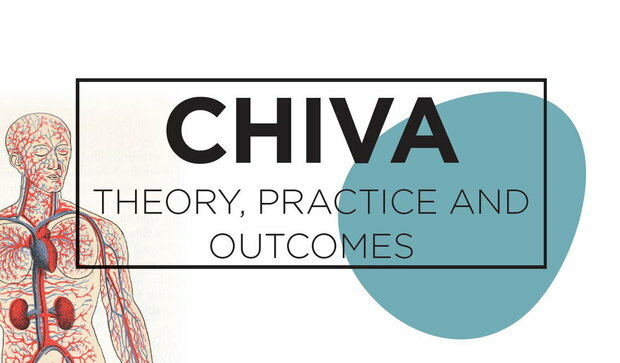 For a long time CHIVA has been wrongly considered a cryptic and difficult theory, reserved to few experts in hemodynamics and impossible to be performed in the everyday rush of clinical practice. detect factors potentially influencing hemodynamics (other venous segments incompetence/obstruction). All these factors lead to a customized treatment of the different possible reflux patterns presented by the different patients. 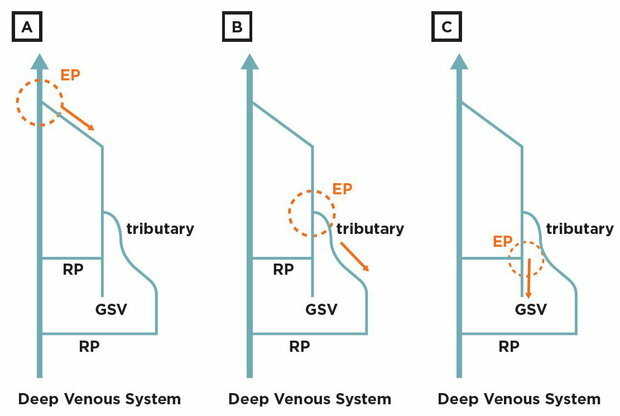 Since several refluxing paths can be created along the superficial venous system, a specific classification of these anomalous patterns has been proposed and based on the so-called shunt concept. A shunt is defined as a venous pathway carrying not only the physiological drainage, but also the pathologically deviated blood. Anatomically and hemodynamically, it starts at the escape point and ends at the re-entry point (RP). In order to define the shunt type, all the assessor needs is to determine where the anatomical compartments involved by the venous reflux are, and where the re-entry perforator is located. In Type I shunt a reflux originates from the deep venous compartment, involves the saphenous axis and eventually the superficial tributaries network. The re-entry perforator is located along the saphenous axis. A typical example is an incompetent saphenofemoral junction (pathological compartment jump of the venous flow from the deep venous system toward the saphenous one), leading to a saphenous reflux, with or without involvement of superficial tributaries, draining the blood back into the deep system by means of a perforator along the saphenous vein. In this case it will be possible to restore a proper drainage by simply closing the escape point by a selective high tie or segmental shrinkage assisted by an endovenous device.10 Eventual incompetent tributaries along the leg can be treated by flush ligation at their confluence with the saphenous trunk. The described procedure is called CHIVA 1. 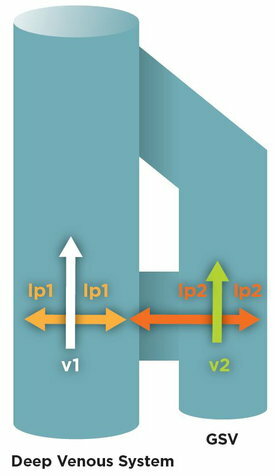 The number “1” of the procedure name comes from the performance of the closure of all the escape points during the same procedure. Doing so, the pathological pressure gradient will be suppressed, together with the related venous reflux, and a favorable pressure gradient will promote a physiological draining through the re-entry perforator. A draining flow will move from the most superficial toward the deepest compartments without escaping once again in the superficial network thanks to the closure of the main escape points. The phenomenon is based on the same application of the above-mentioned laws of physics (Poiseuille’s law and Bernoulli’s principle), (fig. 3). Fig. 3: Type I shunt and CHIVA 1 procedure: Type I shunt is characterized by a pathological compartment jump from the deep toward the saphenous system, eventually also involving the superficial tributaries. A re-entry perforator is found along the saphenous trunk, thus draining the refluxing blood back into the deep venous system. (B) The correct strategy for treating a Type I shunt is a CHIVA 1. In one single step all the escape points are treated: ligation of the escape point among the deep venous system and the saphenous one, together with flush ligation of eventual incompetent tributaries. In case of pathological compartment jump from the deep venous system toward the saphenous system with a re-entry point localized just along an incompetent superficial tributary and not along the saphenous vein, the shunt type is called Type III. In this case, the indication is for a flush ligation of the incompetent tributary confluence with the saphenous trunk, without simultaneous treatment of the escape point among the deep and saphenous system. The procedure is called CHIVA 2—first step. “First step” subtends an eventual second step, which is the closure of the escape point among the deep venous system and the saphenous trunk, 6-8 months after the first step, when an efficient re-entry perforator has developed along the saphenous trunk. In fact, considering the lack of a proper reentry perforator along the saphenous vein in a Type III shunt, ligating simultaneously the incompetent tributary and the junction among the deep and saphenous system would suppress the pressure gradient which moves the blood inside the saphenous vein, thus potentially leading to venous stasis and thrombosis along the same saphenous trunk. For this reason, the lack of a proper re-entry perforator along the saphenous trunk is a main indication to avoid deep venous-saphenous system compartment jumps treatment. a perforator along the saphenous trunk has opened, feeding a pressure gradient from the incompetent junctional escape point toward the deep venous system. In the first case the CHIVA 2—first step has been effective. In the second case a Type III shunt was transformed into a Type I shunt, thus an indication to the treatment of the incompetent junction becomes appropriate. In this case the procedure is called CHIVA 2—second step (since staged after the first step). Clearly, a CHIVA 2—second step is technically equivalent to a CHIVA 1 procedure (fig. 4). Fig. 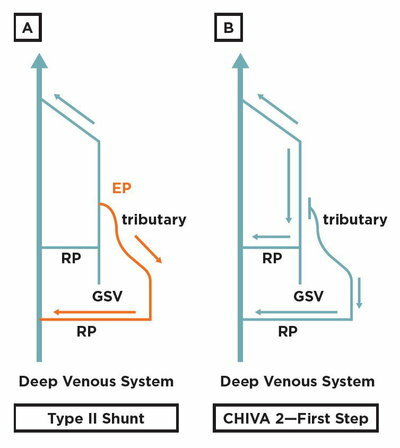 4: Type III shunt and CHIVA 2—first step procedure: Type III shunt is characterized by a pathological compartment jump from the deep toward the saphenous system, involving also the superficial tributaries. No reentry perforator is found along the saphenous trunk, but just along the incompetent superficial tributary. 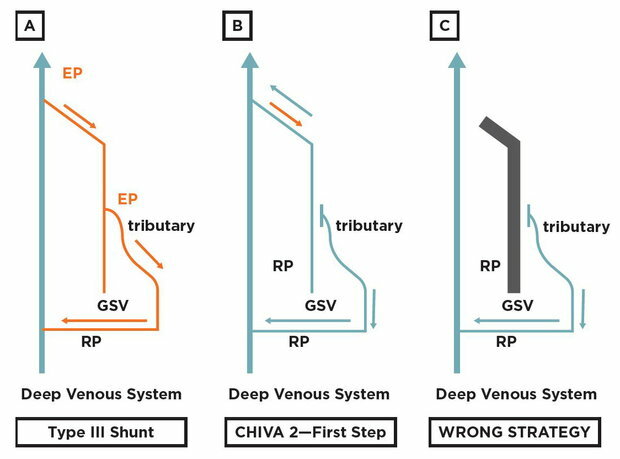 (B) The correct strategy for treating a Type III shunt is a CHIVA 2—first step: a simple flush ligation of the incompetent tributary. (C) Treating also the escape point from the deep venous system toward the saphenous one would be a major mistake, since this would lead to a non-draining system because of the lack of a re-entry perforator along the saphenous trunk. In this scenario venous stasis and saphenous thrombosis could be induced (black tract in the reported figure). In Type II shunt the leaking point is only from the saphenous compartment toward the incompetent superficial tributary. In Type II shunt a simple interruption of the leaking point removes the hemodynamic overload and avoids pathological recirculation. In this case the procedure is a CHIVA 2—first step, with no need to stage an eventual second step (fig. 5). Fig. 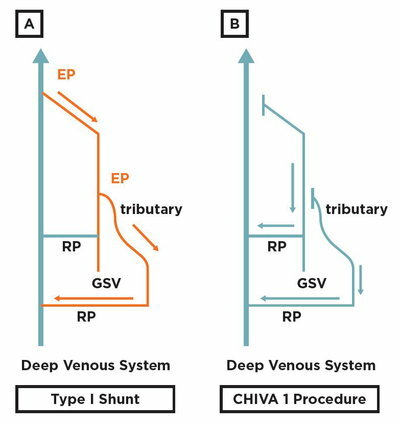 5: Type II shunt and CHIVA 2—first step procedure: Type II shunt is characterized by a pathological compartment jump from the saphenous toward the superficial tributaries compartments. No pathological jump occurs from the deep toward the saphenous system. (B) The correct strategy for treating a type II shunt is a CHIVA 2—first step. From this description, the great importance of identifying the re-entry point localization becomes evident. A re-entry point localized along the saphenous trunk will lead to the treatment of the pathological compartment jump among the deep and saphenous system, while its absence will absolutely contraindicate such a procedure because of the consequent risk of venous stasis and thus potential thrombosis. 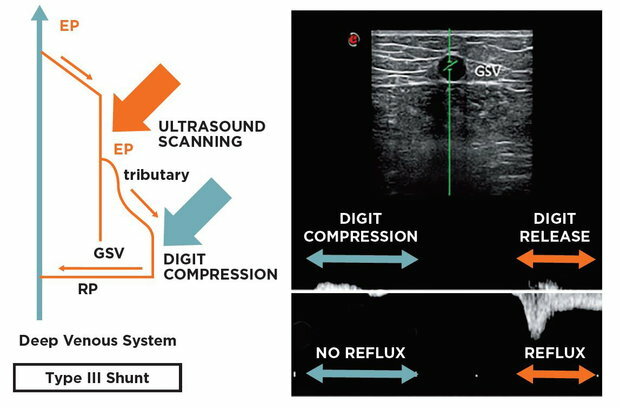 In order to determine the localization of a re-entry perforator on the saphenous trunk, a simple test has been developed called Reflux Elimination Test.2 A digit compression is performed over the incompetent superficial tributaries, thus mimicking the effect of the vessel ligation and of the consequent pressure gradient change. During the test the Doppler probe must be placed along the saphenous trunk, proximal to the investigated re-entry point, proximal to the site of digital compression. A flow is evoked along the saphenous vein by active maneuvers (for example a compression/relaxation maneuver). If the evoked saphenous reflux will be eliminated by the digit compression of the incompetent tributary, the energy gradient addressed to the post-operative saphenous drainage must be considered insufficient to create a draining flow. The phenomenon is linked to the absence of a valid re-entry perforator along the saphenous trunk. Consequently, it will be mandatory to avoid the high ligation in a single step procedure (CHIVA 1). The correct hemodynamic type characterization will lead to the indication of a Type III shunt and the correct procedure will be a CHIVA 2—first step (fig. 6). Fig. 6 Reflux Elimination Test in Type IIII shunt: Type IIII shunt has no re-entry perforator along the saphenous trunk: the pressure gradient feeding the reflux is generated inbetween the escape point (in the herein depicted case the sapheno-femoral junction) and the re-entry perforator localized along the incompetent tributary. For this reason a digit compression of the incompetent tributary eliminates the pressure gradient feeding the reflux. At the finger release, reflux appears, thus indicating that the re-entry perforator is not located along the saphenous vein, but along the previously compressed incompetent tributary. To the contrary, the presence of a saphenous flow during the digit compression of the incompetent tributary will indirectly indicate the presence of a valid re-entry perforator along the saphenous trunk, thus indicating the presence of a Type I shunt, to be treated by a CHIVA 1 procedure. When planning the therapeutic strategy, some new considerations can be made according to recent publications. sparing of the sapheno-femoral junction tributaries, which, according to CHIVA strategy, should drain into the saphenous trunk to promote a draining flow, rather than draining into the femoral stump, as after an endovenous ablation. Nevertheless, a feasibility investigation about endovenous short segmental ablation in a modified strategy was published in 2013,14 reporting the first 20 cases at 1 year follow up in 2015.10 Even if requiring an accurate selection of the refluxing venous patterns, an evolution toward mini-invasive endovenous technique in a saphenous sparing option is possible and potentially promising. Such innovation in chronic venous disease treatment could bring the mini-invasive advantage of the endovenous approach together with the recurrence risk reduction of the saphenous sparing strategy. After a CHIVA procedure, clinical and echo color Doppler assessment is recommended at 6-8 months. In the first three months, hemodynamics adaptation can occur after the treatment of the escape points, so that the strategy also includes the possibility of a “late drainage restoration,” where the reflux progressively disappears. Recognizing the difference between a reflux and a retrograde draining flow is fundamental. While the reflux is a pathological sign, the retrograde draining flow is the natural evolution of a restored hierarchical order of emptying from the most superficial toward the deepest venous compartments. The retrograde flow is characterized by a prolonged low velocity flow emptying into an efficient re-entry perforator. The positive effect of a restored drainage is also evident at the clinical investigation, where a progressive caliber reduction is expected both on the saphenous axis and on the incompetent tributaries.15 According to CHIVA strategy, the main failure is the lack of drainage in the newly created venous network. A typical case could be the selection of an invalid re-entry point, as in performing a CHIVA 1 strategy to treat a Type III shunt, where there is no valid re-entry perforator along the saphenous vein. This mistake would lead to venous stasis and thus to an increased risk of thrombosis. In 2013 and 2015 Cochrane pointed out the CHIVA strategy long-term efficacy, reporting better outcomes in terms of recurrence rate compared to surgical venous ablation.7 Nevertheless, Milone’s paper remains the fundamental one, pointing out the need of an adequate learning curve before practicing this strategy. CHIVA strategy represents an effective saphenoussparing therapeutic approach for lower limb chronic venous disease. It is performed by selective treatment of the leaking points of the venous network, transforming a reflux in a physiologically draining flow. Adequate training is required, but all vein specialists can easily approach it. In everyday practice, CHIVA strategy offers a technically simple and effective procedure, totally feasible under minor doses of local anesthesia, with no need for sedation or tumescence. In terms of cost-effectiveness, no particular devices are required and an office-based setting is more than suitable. A modified CHIVA strategy can include the use of endovenous devices, suppressing the reflux while sparing both the saphenous trunk and some procedural time.10 Literature has demonstrated that, compared to the traditional ablative strategy, CHIVA offers the chance of a smaller recurrence rate with fewer post-operative complications. On the other side, some major points remain open in all saphenous sparing approaches. First of all, further investigations are needed regarding the possibility of sparing the saphenous trunk in those cases of reflux fed by an incompetent tributary emerging from the saphenous vein few centimeters distal to the sapheno-femoral junction. Another major point of discussion concerns the need for comparing oranges with oranges and apples with apples. Unfortunately, the vast majority of the available literature doesn’t characterize precisely the reflux pattern and the hemodynamics conditions. For example, most of the time no specific data are reported regarding the competence of the femoral valve: a risk factor for recurrence rate. The same risk factor exists concerning the presence or absence of a re-entry perforator along the saphenous vein, potentially triggering major hemodynamics impairment. In conclusion, while analyzing saphenous sparing and ablative procedures, the need for standardizing our diagnostic process becomes evident, as well as the need to go back looking for a deeper knowledge of the hemodynamics prior to moving forward in the technological advancement of the therapeutic devices. Only in this way will we be able to stop comparing apples with oranges, offering a true advancement to our patients, not just in the technique but also in the applied strategy. Franceschi C. Théorie et pratique de la cure Conservatrice et Hémodynamique de l’Insuffisance Veineuse en Ambulatoire. Editions de l’Armançon Precy-sous-Thil France 1988. Gianesini S, Occhionorelli S, Menegatti E, Zuolo M, Tessari M, Spath P, Ascanelli S, Zamboni P. CHIVA strategy in chronic venous disease treatment: instructions for users. Phlebology 2015;30:157-71. Gianesini S, Sisini f, Di Doenico G, Secchiero J, Malagoni AM, Menegatti E, Gambaccini M, Zamboni P. Lower limbs kinetics and consequent impact on drainage direction. Phlebology 2017 Jan 1:268355516688775. doi: 10.1177/0268355516688775. Shepherd AC, Quereshi MI, Davies A. The descending or saphenocentric theory of superficial venous insufficiency. Phlebology 2011;64:16-18. Puleo V, Castagno PL. Progression of superficial venous insufficiency: analysis and implications for therapy. J Vasc Diagn 2013;1:5-11. Bellmunt-Montoya S, Escribano JM, Dilme J, Martinez-Zapata MJ. CHIVA method for the treatment of chronic venous insufficiency. Cochrane Database of Systematic Reviews 2015, Issue 6. Art. No. : CD009648. DOI: 10.1002/14651858. Tisato V, Zauli G, Gianesini S, Menegatti E, Brunelli L, Manfredini R, Zamboni P, Secchiero P. Modulation of circulating cytokine-chemokine profile in patients affected by chronic venous insufficiency undergoing surgical haemodynamic correction. J Immunol Res 2014;2014:473765. Milone M, Salvatore G, Maietta P, Sosa Fernandez LM, Milone F. Recurrent varicose veins of the lower limbs after surgery. Role of surgical technique (stripping vs. CHIVA) and surgeon’s experience. G Chir 2011;32(11-12):460-3. Gianesini S, Occhionorelli S, Menegatti E, Malagoni AM, Tessari M, Zamboni P. Femoral vein valve incompetence as a risk factor for junctional recurrence. Phlebology. 2017 Jan 1:268355517690056. doi: 10.1177/0268355517690056. Gianesini S, Menegatti E, Malagoni AM, Occhionorelli S, Zamboni P. Mini-invasive high-tie by clip apposition versus crossectomy by ligature: Long-term outcomes and review of the available therapeutic options. Phlebology 2017 May;32(4):249-255. Passariello F, Ermini S, Cappelli M, Delfrate R, Franceschi C. The office based CHIVA. J Vasc Diagnostics 2013:1:13-20. Gianesini S, Menegatti E, Zuolo M, Tessari M, Ascanelli S, Occhionorelli S, Zamboni. Short endovenous laser ablation of the great saphenouos vein in a modified CHIVA strategy. 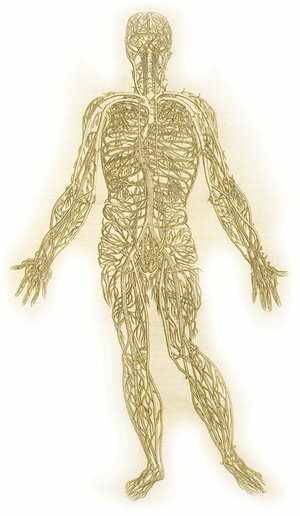 Veins and Lymphatics 2013;2:2. Gloviczki P et al. The care of patients with varicose veins and associated chronic venous diseases: Clinical practice guidelines of the Society for Vascular Surgery and the American Venous Forum. J Vasc Surg 2011;53(5 suppl):2S-48S. Zamboni P, Cisno C, Marchetti F, Mazza P, Fogato L, Carandina S, De Palma M, Liboni A. Minimally invasive surgical management of primary venous ulcers vs. compression treatment: a randomized clinical trial. Eur J Vasc Endovasc Surg. 2003 Apr;25(4):313-8. Erratum in: Eur J Vasc Endovasc Surg. 2003 Sep;26(3):337-8. Chan CY1, Chen TC, Hsieh YK, Huang JH. Retrospective comparison of clinical outcomes between endovenous laser and saphenous vein-sparing surgery for treatment of varicose veins. World J Surg. 2011 Jul;35(7):1679-86. doi: 10.1007/s00268-011-1093-8. Hua Wang1, Qianyi Chen1, Zhewei Fei1, Endong Zheng2, Zhanghui Yang2, Xiaowang Huang. Hemodynamic classi cation and CHIVA treatment of varicose veins in lower extremities (VVLE). Int J Clin Exp Med 2016;9(2):2465-2471.